I've played a lot of games over the past 29 years. I've been wizards, warriors, soldiers, pilots, businessmen, cops, athletes and actors. One thing I've never been, until now, is the despotic ruler of a tinpot Caribbean island. Tropico 3 is the third game in a series that tasks you with assuming control of small, tropical islands then building the most benevolent (or malevolent) regime you can manage with the limited resources at hand. While the second game shifted emphasis to the age of pirates, this one takes us back to the age of Batista and the Cold War. 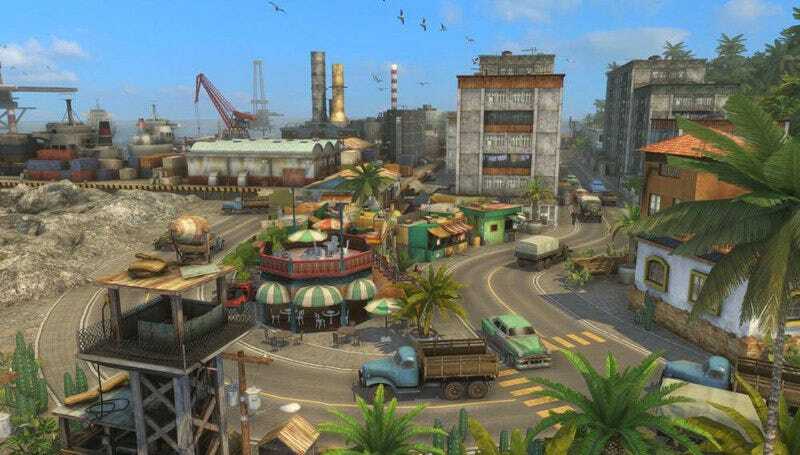 Can Tropico 3 lead its people into a new era of peace and prosperity? Or will it be taken out back and shot with the rest of the revolutionary pigs? It's Good To Be The King - I've got to say, having never played a Tropico game before, I love the premise. It sounds completely uninteresting, but there's a reason power-mad little men are always fighting for total control over small Latin American countries: it's fun. Or, at least, these games make it fun, somehow glossing over the nastier aspects of totalitarian rule, and whatever is left, brushing it off with a smile and a wink. Hands-On Rule - In Tropico 3, you're not some ethereal presence, hovering over the land as a mouse pointer. You're given an avatar - which can be suitably customised with big hats, cigars and medals - who can wander around the countryside on foot or in a limo, inspiring the people to do things faster/better. It's a shame more strategy games don't do this, as it's nice to see your rule given a little on-screen representation outside a collection of statistics. Zeitgeist - Like I said, Tropico makes the Cold War fun. But it also does a good job of basing both its tone and indeed core gameplay on the politics of the time. The entire game hinges on your ability to interact with the US and Soviet Union, and having to both manage your daily affairs and keep the superpowers happy adds a nice piece of context to your actions. Simlish - I'm often intimidated by strategy titles that have you rule your kingdom/land via numbers and sliders. Tropico still does this, but the way it provides feedback is a big help, taking the route of more recent SimCity titles and making each inhabitant a personality, who will tell you how hungry they are, what their job situation is like, etc. Seeing angry mobs forming on street corners, or groups of workers trudging off happily to the banana plantation, is a much better way of presenting the workings of your government than raw numbers. The Garden Path - With a big strategy game like this, you need a good tutorial. Problem is, Tropico 3's is too good to start with, then not good enough for the more complicated matters of state. It could have done with smaller training wheels, but leaving them on a little longer. Click & Miss - Tropico is a fully 3D game. No grids or tiles here. Which leads to problems laying down roads and buildings, as quite often the game seems to delight in refusing to link up two perfectly compatible pieces of road, or in letting you place a building on a perfectly flat piece of ground. So, yeah, the actual process of enacting your will can be a little hit-and-miss. Shut Up - To update you on the status of your people and your island, you'll continually be interrupted by DJ Juanito, telling you this, telling you that, all in the most grating voice an actor could possibly manage. If only the game had an option to have the man shot. Tropico 3 won't be to everyone's tastes, sure; at the end of the day, it's still a "proper" strategy game, requiring you to juggle resources, micromanage the economy and make sweeping diplomatic decisions. But the way the game wraps all that up and personifies it, immersing you not just in the stats but in the world, also makes it one of the more accessible and presentable games in the genre. While it's a little rough around the edges, Tropico 3 is a game you can't help but be impressed with, its vision, black humour, originality and sole tenancy over a gratifying niche outweighing any issues you may have with the game's learning curve or interface. Tropico 3 was developed by Haemimont Games, and published by Kalypso Media for the PC (version played) and Xbox 360. Released on October 20 on PC, and on February 2, 2010 on Xbox 360. Retails for $40. Played all 15 "missions", and spent considerable time in sandbox mode. Smoked two cigars, had countless dissidents shot, and consumed several glasses of expensive French brandy.